Disney rules the world of Amusement Parks, eight of the ten most popular parks in the world are Disney parks (number 1 to 8!). Overal all Disney Parks attract more than 126 million visitors a year. Originally divided into six distinct, separately themed islands, the theme park proudly opened its seventh island in June 2010 ‘The Wizarding World of Harry Potter’ instantly boosting its popularity with fans of the fearless young wizard and his band of friends. Average visitor numbers shot up after this attraction opened, by almost 2 million people per year! The other islands are equally attractive to children and adults of all ages featuring the marvellous Dr Seuss, Marvel Superheroes and Jurassic Park amongst other childhood favourites. Visit Hogwarts, sip a butterbeer in The Hog’s Head or explore the depths of the Forbidden Forest, before seeing a Triceratops getting a check-up from a resident veterinarian and taking flight with pteradons. Try out all fifteen rides, of which 3 are water-based rides for those who love to get splashy and 4 are roller-coasters. The park is divided into nine areas, each named for a major city or for the theme upon which it is based. Thus, New York features Spiderman and Terminator, while the Sesame Street Fun Zone is filled with rides and attractions featuring the lovable antics of Bert and Ernie, Elmo and Big Bird. Sometime this year a tenth attraction will be added The Wizarding World of Harry Potter with the spookily named Harry Potter and the Forbidden Journey expected to become a flagship ride in short order. The theme park has won many industry awards and attracts more and more visitors every year. Mickey’s wizard’s hat from the Sorcerer’s Apprentice in Fantasia marks the entrance to this delightful experience. Aimed at recreating not the physical town of Hollywood, but rather the hope, magic and glitter of the idea behind Hollywood, the theme park is dedicated to show business, clearly embracing the roots of the industry from the thirties and forties. The rides are strongly themed around classic movies and the entire park is laid out to form something of a cross between a town and a movie set. When seen from the air, it is possible to see the face of Mickey Mouse (Echo Lake forms one of his ears, for scale and ease of pinpointing his whereabouts!) although recent construction and development has partially covered it up. Do not expect a traditional amusement park, but older children and movie buffs will have an amazing time here, learning about the ways and workings of the amusement industry with frequent live performances, both scheduled and impromptu, many of which demand the participation of the audience. This immense park stretches over 500 acres, making it the second largest theme park in the world, and the largest of the Disney global franchise. There are seven themed areas in the park, all designed around animals and natural habitation, some real and some extinct – there is even room for myth at the Animal Kingdom, with Avatar: the World of Pandora currently under construction, an homage to James Cameron’s epic film with curiously glowing plants, blue skinned people and their beautiful flying creatures or ikran. 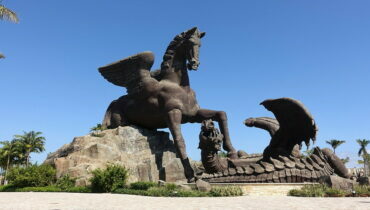 Sadly, another monument to mythical creatures, the Beastly Kingdom, was never built due to budget constraints. It would have been immensely popular, with plans to populate it with unicorns, dragons and sea monsters. Because the welfare of the animals is paramount, the park does not have any firework displays and the park closes earlier than other amusement parks. Epcot, or Experimental Prototype Community of Tomorrow, is not your traditional amusement park, with large Disney creations wandering around to dispense hugs and pose for photographs, while screaming hordes ride rollercoasters, water rides and carousels. Rather, it is a celebration of invention, technological innovation and human achievement, rather like a giant, glorious science fair! Epcot is instantly recognisable from the immense metallic ball that towers over the nearby surrounds, Spaceship Earth which is a geodesic sphere. Epcot was originally going to be a fully-fledged town; one designed, constructed and regulated to the last degree. It would have offered underground roads, to keep pedestrians safe as they walked, ran or played, amongst a host of other, ostensibly user-friendly rules and regulations. However, Disney died before Epcot could be fully implemented and it was decided to use the site to celebrate America enterprise and ingenuity. There are two broad divisions in Epcot, one being the World Showcase, an immense display of the biggest, brightest and best that the world has to offer, and Future World which provides a glimpse into the future of our world, from a scientific and technological point of view. Older visitors will be enthralled, while very young children may become restive. Originally called Euro Disney, this park is the most visited park in Europe. The grounds are divided into five sections, containing around 49 different attractions. The reason for the name change is as follows: The name Euro, while romantic and continental to Americans, sounded practical and business-like to Europeans who associated the word with the currency, and therefore finance, banking and other ‘grown-up’ pursuits! 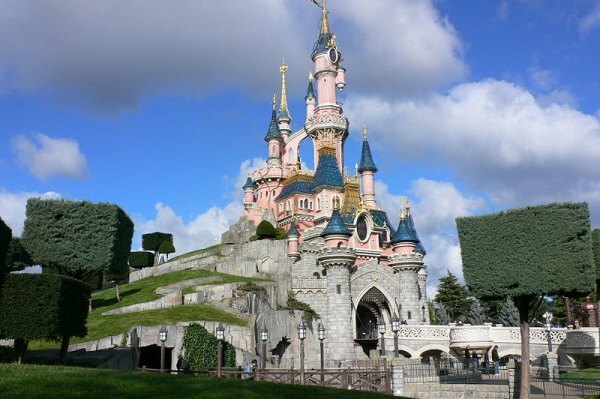 The whole park is represented by the castle from Sleeping Beauty, known as Le Chateau de la Belle au Bois Dormant in French, a building which is instantly recognisable all over Europe and the United Kingdom by children from about the age of three! Tokyo DisneySea and Tokyo Disneyland are the only two amusement parks that bear the Disney name, without being owned by the Disney Corporation. Rather, the name and rights to use the characters and so forth is leased from Disney by The Oriental Land Company. Despite this, the park has a strongly familiar Disney flavour to it, even featuring a dedication by head of Disney, Michael D Eisner. The park is divided into seven areas, each boasting a distinctly watery theme, whether it be mermaids, or pirates, or the lovely Mysterious Island, home to the beautiful volcano Mount Prometheus which is the symbol of the whole park. This is the original Disney theme park, and the only one to be opened and operated during Walt Disney’s lifetime. Opened in July 1955, Disneyland has received more cumulative visitors over its lifetime than any other amusement park in the world, with over 650 million guests having passed through the gates! As with the French Disneyland Park, the castle of Sleeping Beauty is the motif of the park, which is divided into eight separate sections. Employees use stage terminology at work, referring to public areas as being ‘onstage’ and colleagues as cast members. This is a result of the presentation of the park to the public as being an enormous event, put on and played out for each and every visitor. Much loved characters stroll along the wide avenues, posing for photographs, giving hugs and enchanting generation after generation of wide-eyed youngsters – and not-so-youngsters too! Finish off your visit by watching one of the awe-inspiring firework displays, a pyrotechnic splendour that is usually accompanied by music from favourite Disney films and occasionally brightened by an appearance from Dumbo or Tinkerbell. The final of the four theme parks that comprise the group known as Walt Disney World Theme Parks, the Magic Kingdom is the one that most uninitiated visitors refer to when they say they want to go to Disney land! (The other three are Epcot, The Animal Kingdom and Disney’s Hollywood Studios, all of which feature on this list.) A massive and breathtakingly beautiful Cinderella’s castle overlooks the entire park, giving visitors a landmark with which to navigate by. However, this is something of an optical illusion, using forced perspective – the castle stands only 55 metres tall, but looks much bigger thanks to the use of forced perspective in which each successive floor is shorter than the one above, tricking the eye into thinking that it is much higher than it really is! The park is divided into six distinct areas, arranged in a loose circle. A narrow-gauge rail runs around the perimeter of the park, stopping at three of the six sections. The railway is called the Walt Disney World Railroad. Just recently, prices to enter the Magic Kingdom have gone into triple figures, now setting you back a cool US$100, for the first time ever – but this is thought to be unlikely to put anyone off. After all, where else in the world can you dance with Snow White, get a hug from Winnie-the-Pooh and see Mickey Mouse in person, before watching an almost magically beautiful firework show?